As a child, I was brought up with all things magical, fairy and Aurthurian folklore, and I shared this fantasical world with my children. I also played in my grandfather’s garden with my dolls who always magically came to life next to me. I was lucky enough to inherit the green thumb gene from both he and my father. As I grew, discovering that growing up IS NOT an option, I found myself in a variety of occupations that allowed me to be creative. I designed costumed for various Renissance festivals, worked in a few garden centers and even became a hair dresser by trade. I continued working in my own gardens daily to keep me grounded, pun intended. Several years ago, I decided to live another dream of mine, and enrolled in a porcelain doll making class. I was only going to take four classes. I ended up returning for the next eight years. Afterward, I took private sculpting classes in person and on line. Next thing I knew I had gained a wide range of friends in the doll making community. Many of them have turned into very close friends, who I learn new thechniques from on a constant basis. 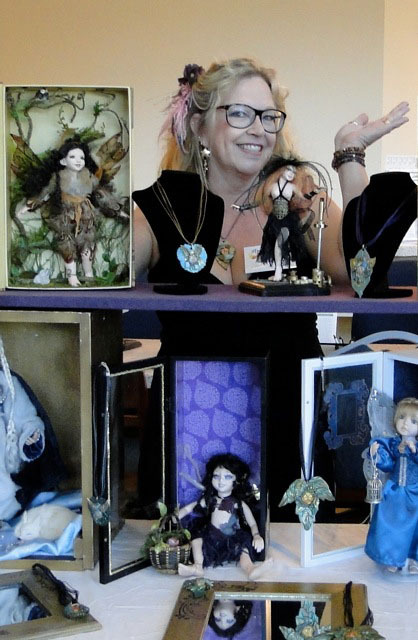 A few years ago, I took my love of dolls, nature, and magical things and combined them in a new venture, beginning yet another magical chapter in my life. Hence, Nature’s Fae was born.